Any provocative action by the Pakistani forces will be responded to with "equal and more measures", the Border Security Force told Pakistan Rangers on Friday as their senior commanders held a meeting against the backdrop of cross-border firing incidents. 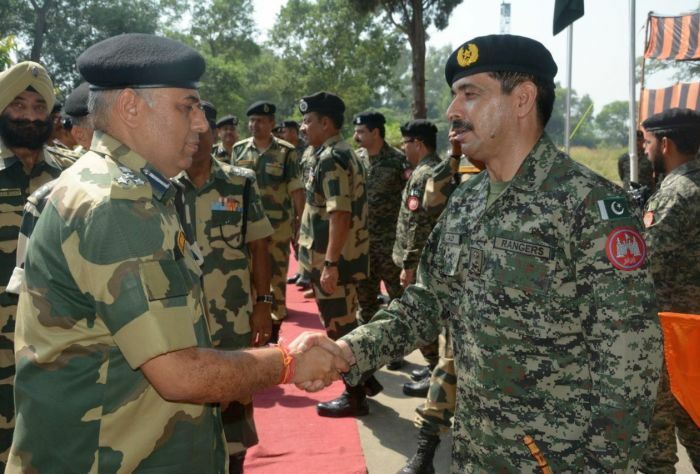 The sector commanders of the BSF and Pakistan Rangers held a flag meeting, after a gap of about seven months, a BSF spokesman said in Jammu. The meeting in Suchetgarh sector of the International Border, which lasted for about 105 minutes, took place on the request of Pakistan Rangers, the spokesman said. Both sides agreed to maintain peace and tranquillity along the International Border, the spokesman said. "The meeting was held in a cordial and positive atmosphere and both sides agreed to expedite the implementation of the decisions taken in an earlier meeting," he said. However, the Indian side made it clear to the Pakistani delegation that "any provocative action would be responded to with equal or stronger responses." The BSF strongly objected to the sniper fire from the Pakistani side in which its two soldiers -- constables Brijendra Bahadur and K K Appa Rao -- were killed, the spokesman said. "The BSF also protested the unprovoked cross-border firing and shelling on a number of Indian border villages leading to the death of a woman in Arnia sector on September 4," he said. Infiltration attempts at night were also discussed, the spokesman said. "The Pakistan Rangers assured to take measures to maintain peace at border with a request that the BSF should also exercise restraint to ensure minimum loss of civilian lives on the Pakistani side," the spokesman said. He said the two sides decided to re-energise instant communication between the field commanders to resolve petty matters. The Indian delegation, comprising 17 officers, was led by BSF DIG-Jammu Sector P S Dhiman, while the 14-member Pakistani side was led by Sector Commander of Chenab Rangers-Sialkot Punjab Brig Amjad Hussain. The last Sector Commander-level meeting between the two forces was held on March 9.